Call Now! 770-971-2778 :: Hours: Mon-Fri 8:00 a.m. to 5:00 p.m.
Polished concrete floors with colored and decorative finishes offer sharp aesthetics, high durability and low maintenance. 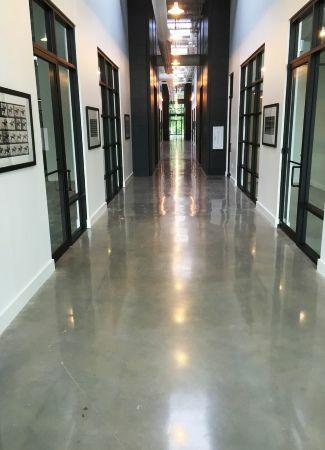 Polished concrete floors are ideal for commercial, industrial and residential applications. The options for improving the visual appeal of concrete has advanced far beyond construction techniques such as stamping or textured finishes. Today a concrete floor can be colored using stains, dyes and paints – and applied to achieve a wide variety of patterns, styles and designs. There is a wide variety of colors for concrete. Concrete Finishes has over 35 years of experience finishing concrete. We understand concrete’s composition, and how to work with new and old concrete. Our knowledge of concrete is an assurance to you that we can do the job properly. We can deliver the look that you have in mind, and a finish that has longevity. Obviously the time and cost to polish and/or color concrete varies on every job. Factors include the amount of surface prep to be done, the type of finish desired, and the intricacy of the color or design. Surface preparation may include concrete grinding which is a multi-step process. Some floor designs require saw-cutting, patching, leveling or topping. For the application of coloring it is common to apply a densifier, the dye, stain or paint. Some projects require a top coat to seal the concrete. The options for improving the visual appeal of concrete has advanced far beyond construction techniques such as stamping or textured finishes. Today a concrete floor can be polished to a rich luster, and colored using stains, dyes and paints. There are countless design possibilities using a wide variety of patterns, styles and designs. Templates and stencils allow you to have ornate floor designs. We offer our customers a large selection of color choices for concrete. Decorative colored concrete is done after the concrete has been placed, finished and cured. Prior to the techniques mentioned here the most common way to get colored concrete was to have color blended in for the original pouring of the concrete. We can remove existing floor coverings, resurface and prep the concrete, and apply a new decorative finish. When it comes to creating decorative colored concrete floors there are several methods. Each product has its own merits and unique characteristics. Use the following links to learn more about concrete floor stains, dyes and floor coatings. Concrete Finishes Inc ~ © 2017. All Rights Reserved.